Home Materials Group May 2 (English) In theses about an event on the 2nd of May in the House of Trade Unions in Odessa. 1.The supporters of Kulikovo were congregated for the defense of the house of TU consciously and beforehand . The records of witnesses, photo and video facts (in particular open calls to actions and instructions from the stage of the Kulikovo field), facts about spreading of the agitation materials were fixed. 2. For some reasons the police didn’t want to defend people on the Kulikovo field or organize the protection of it around all the perimeter. They didn`t evacuate people in Kulikovo before the coming of the crowd of the euromaidan people, who were going there with obvious and clear intention to destroy the tent city. 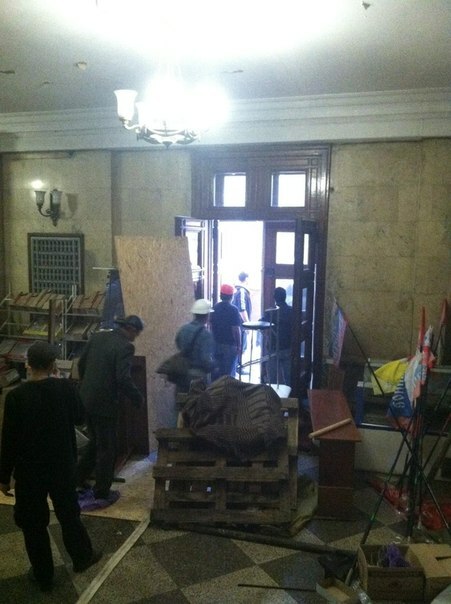 3.The barricades and firing points were made (in few hours) by forces of Kulikovo in the House of TU. Also it was brought a big number of flaming blends, the first-aid posts and places for lodging for the night were equipped. Except photo and video facts, as well as the pieces of the direct and indirect evidence, it is denoted by the availability of the witnesses` records and the records of the opposition participants from the both sides. The very beginning of replacing the camp into the House of TU. As you can see, even palettes were brought into the lobby. The doors are wide open, people don’t afraid of anyone and they are looking like hosts. 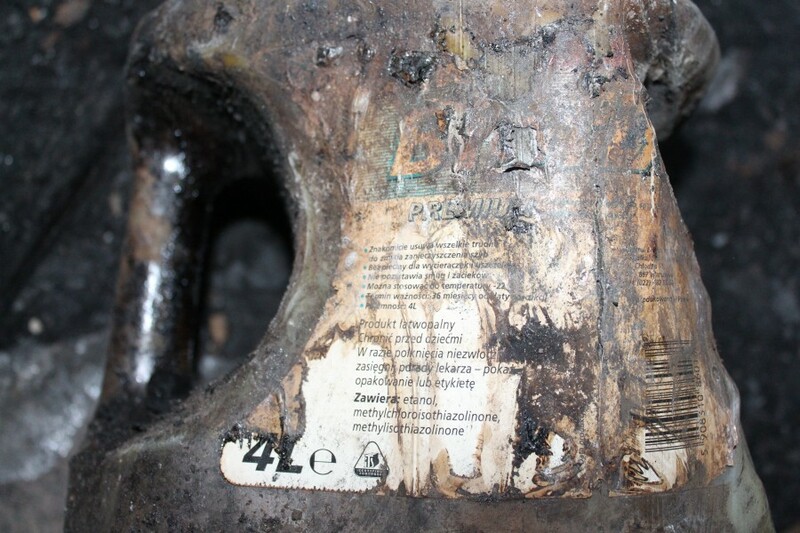 One of the many cans of flammable substances for preparing the Molotov coctails, remaining after removal of the evidences by the investigating authorities. 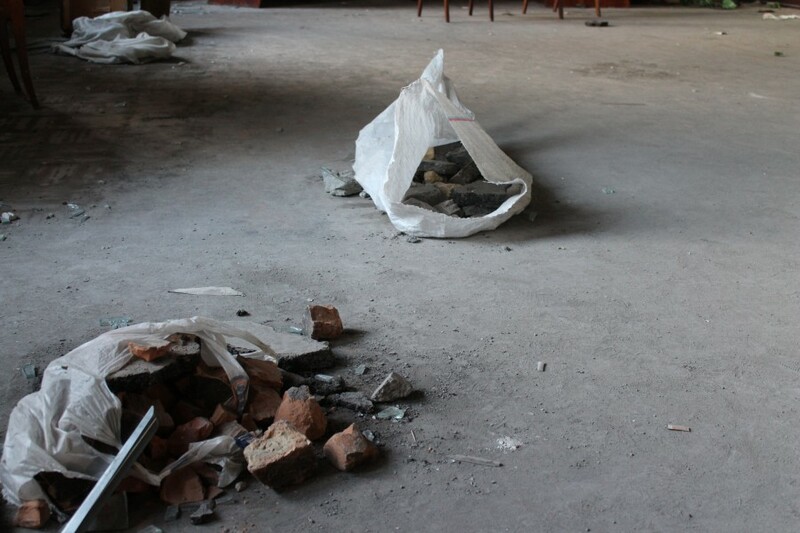 Unburned remnants of barricades on the landing between the third and fourth floors. 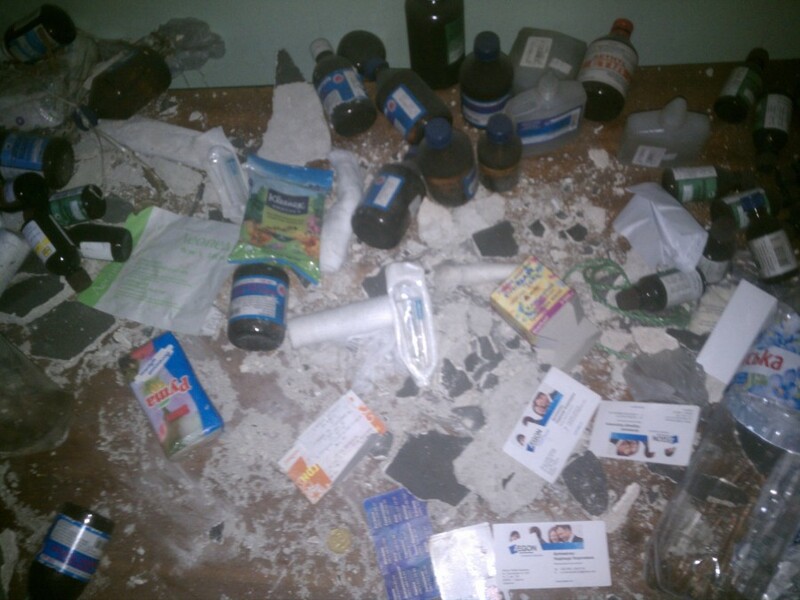 A big number of dressing, first aid facilities and essential medicines laying on the nightstand and on the floor was found here and also in the room № 432. 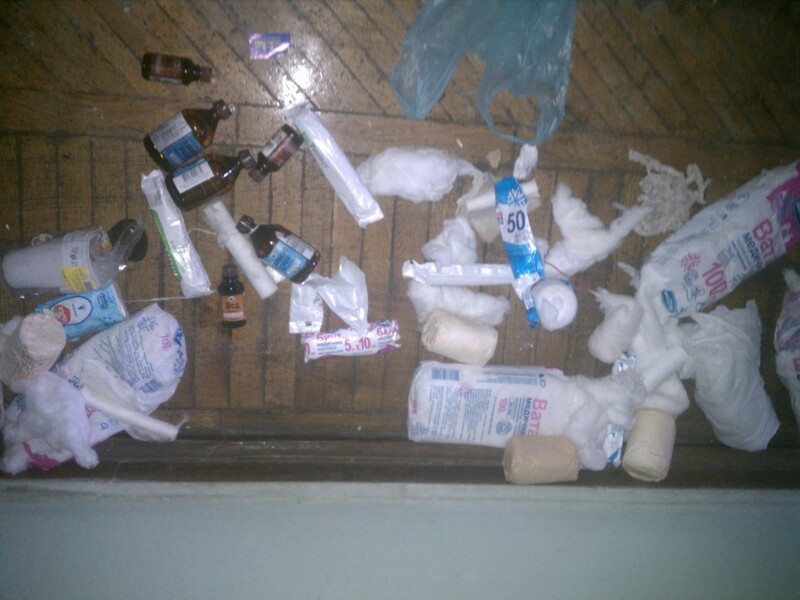 The collection of these first aid boxes, particulary, had served as a reason for organizers to make an urgent call for activists to the Kulikovo field by contacts which they already had (the evidence of participants in the events in the House of TU). The remains of stones, prepared and carried in sacks to the firing points. 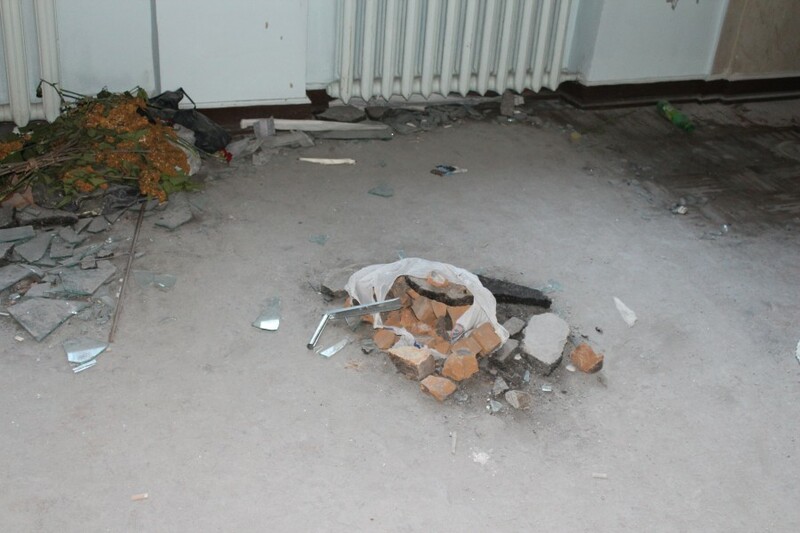 The Molotov cocktails and also the stones left next the firing point in the left window of the second floor corridor. 4.Without regard to the obvious danger for people’s lifes, some definite chiefs of the Kulikovo field (Albu,Davidchenko and others) had enticed about 380 people with lies and outright calls into the house of TU. 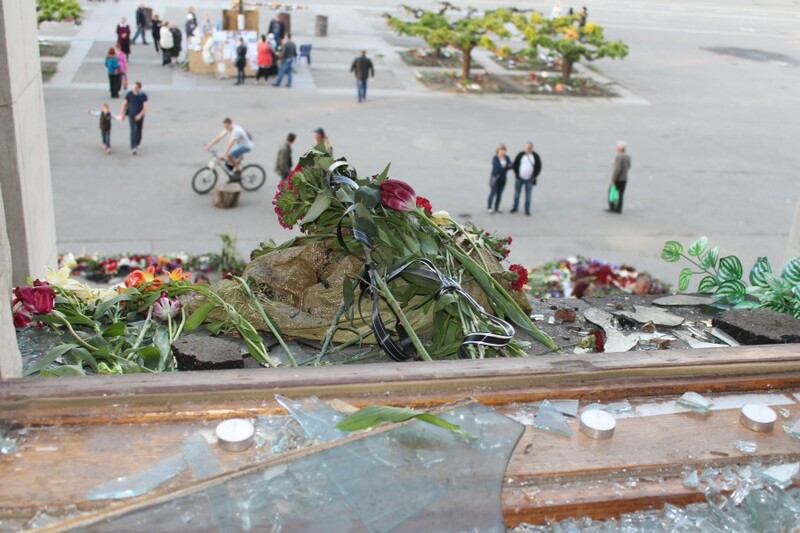 In order to get that done, during the smash at the Grecheskaya square there were made some operative phone calls to the emphasizing people, among other things, on the plea of collection of first aid kits and other essential stuff (The complete mobilization was annunciated). Also a part of the people were lured from the final stop of the tram №18 into the House of TU in consequence of panic appeared because of disinformation connected with the tramcars` mining and calls to save themselves in the building of TU (the records of witnesses). Thus,the handful of 50 people had increased to 400, according to witnesses. The mark was at 7.40 when Davidchenko said from the scene: “Nobody leaves!! !For 20 minutes!! !And waves his hand in the direction of the house of TU. 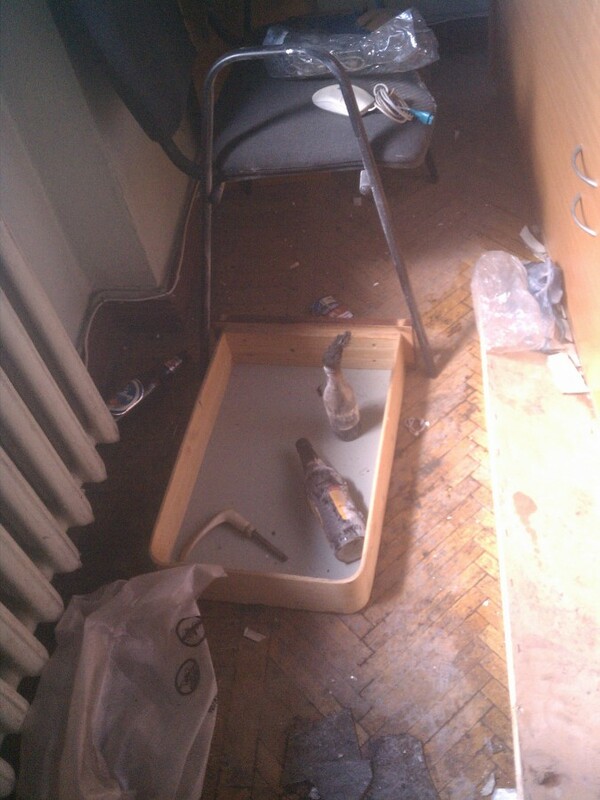 5.The crowd which attacked the Kulikovo field was met by shots from a firearm,rockets and the Molotov cocktails by the Kulikovo assailants from the emplacements of the TU house (also from the roof). But the euromaidan people had no idea that a huge number of the unarmed people also sheltered in the TU house (see p.3) and were making aggressive actions in response that led to the flame formation of the barricades in front of the entrance at first, and then inside the House of TU. As for burning tents, it happened primarily, but there are some reasons to assume that some of those tents had lit up because of the shooting of pistols or throwing the cocktails from the roof of the house of TU by the Kulikovo people themselves. (Photo and video material, eyewitness accounts, direct and circumstantial evidence). The trace of shot from a flare gun from the roof of the House of TU. Shot from a sawn-off shotgun (which is also seen in another video inside this room) in the center of the frame. The same shot from inside. A man at the window on the left. 0.44 mark. You can hear the shot and see the weapon. The same evidence with the description. The evidence that proves the seriousness of approach to throwing the Molotov cocktails from the roof of the house of TU .marks 5.10 and 7.50. 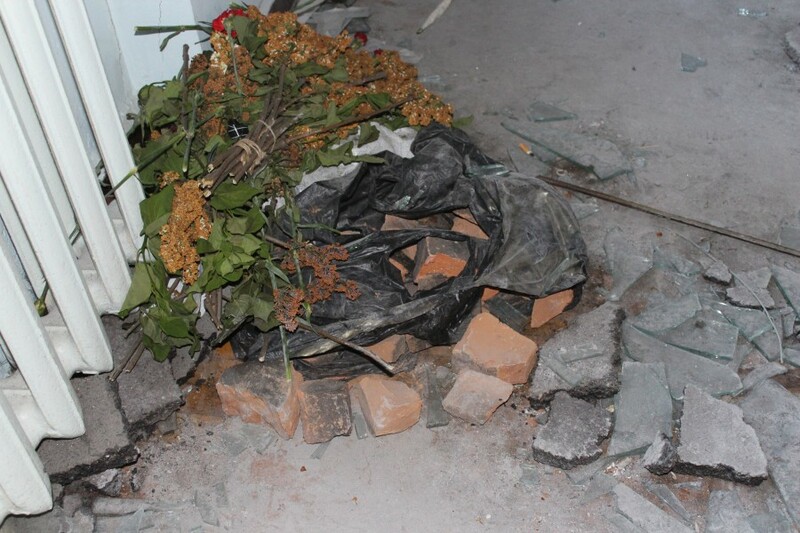 6.The ongoing protection of house of TU by active Kulikovo people in the moment of fire spreading (including firearms) did not allow them to escape the firing points to secure part of the building on time,and also inhibited saving people who needed it (from the side of the euromaidan people and from the side of MOE by official version). This fact is also confirmed by direct and indirect pieces of evidence, photo and video materials, the forensic medical examination conclusion of cause of people`s death, the thermodynamic model of the fire, the records of the witnesses and participants of the events, and also by the official report of Vladimir Bodelan on the consecution of the fire-fighting operations. 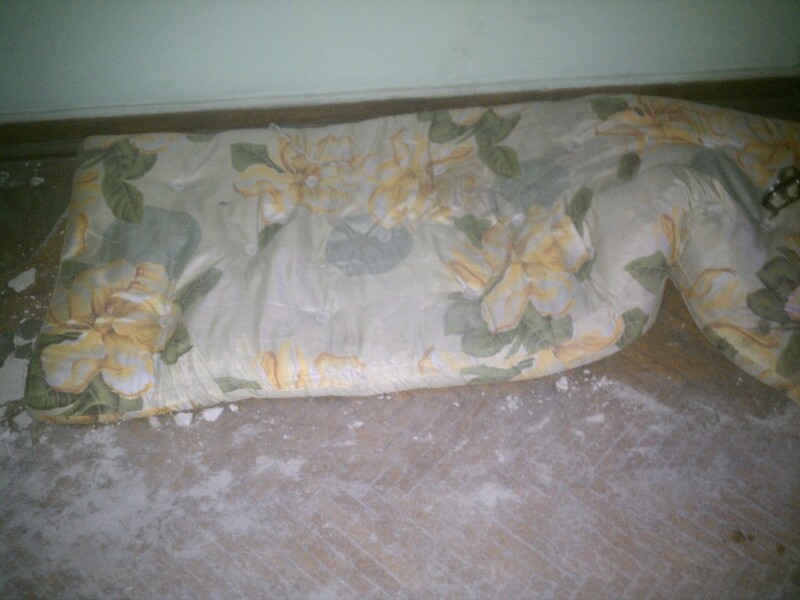 7.The penetration actions into the house of TU of the euromaidan people and Ultras,including the usage of a traumatic, sporting guns chambered for Flaubert 4 mm and airguns, led to impossibility to evacuate for frightened Kulikovo people with the help of the left side of the building, as a result, they gathered in the center and the right side of the building. The central exit was also blocked with fire. 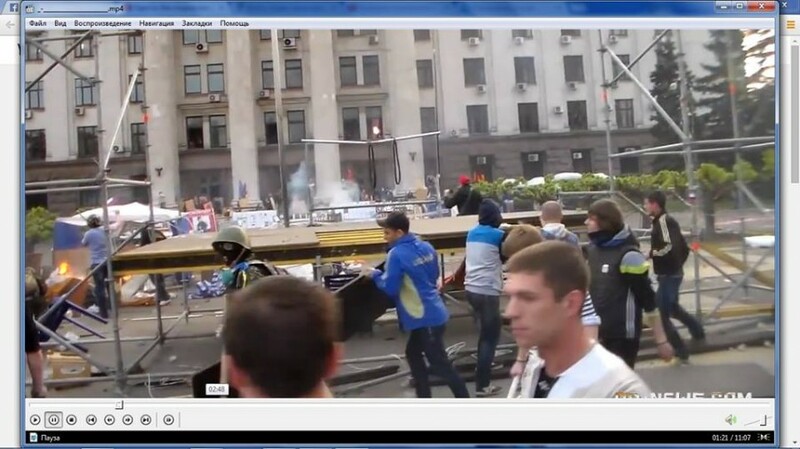 According to journalistic groups independent investigation “the 2-nd of may group” http://2maygroup.blogspot.com/ , the battle groups of the euromaidan people had firearms but there were no facts of using it (traces of bullets, victims or videos showing the usage of this weapon).It is known about the traumatic weapon usage by centurion Mikola,and also there are a piece of evidence and testimony of the injured from the usage of a revolver chambered for Flaubert at one of the windows of the Green auditorium available. 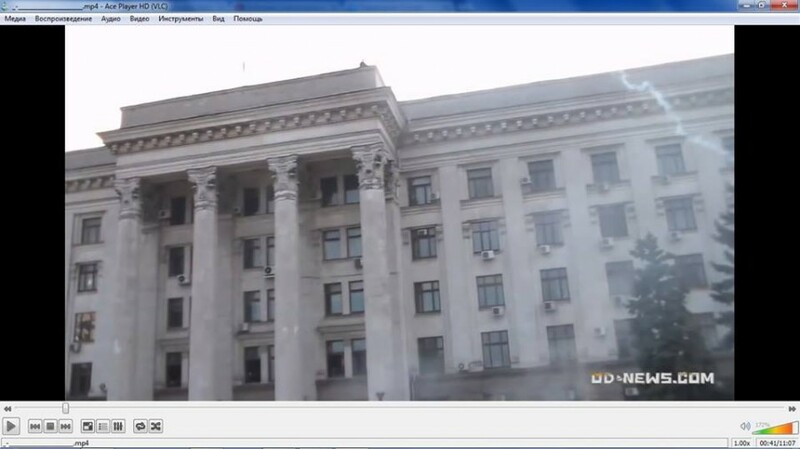 Mikola firing in response at the window (presumably corridor 4th floor, second from the corner). 6.10 mark. The third, fourth, fifth and sixth pictures below publication. Description of the evidence connected with the usage of revolvers chambered for Flaubert on one of the windows of the Green auditorium. http://numikosov.livejournal.com/#asset-numikosov-1121 , the reviewing of the setting out the TU building as of the 4th of May and its matching to the technical dossier of 1997 etc). 9. A big number of flaming materials (including explosive) in the structure of the barricade in the lobby on the 1st floor ensured deflagration and the fire spread, also high temperature (up to 800 d.by C) and extremely smoky corridors in the building of the central part of the house of TU. But the central stairwell remained relatively low smoked in the first phase of the fire (lobby burning) because of the inflow of fresh air from the windows of landings. 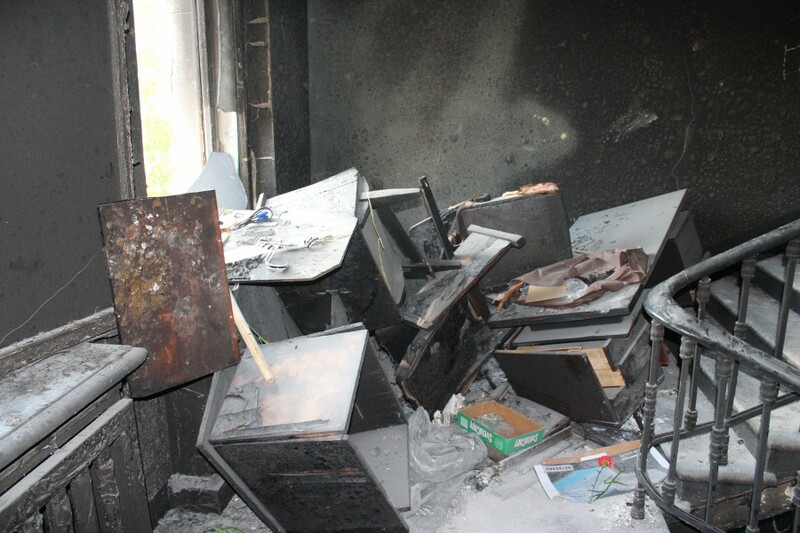 (The testimonies, photo and video materials, thermodynamic model of this fire, expert assessment of the flammability of materials and surfaces involved in the burning building space of TU, the study of the remnants of burnt materials (including barricades in the lobby), the evidence in the form of samples of combustible liquid and container where it was hold and other credible and relevant information ,http://numikosov.livejournal.com/#asset-numikosov-1121 ,http://numikosov.livejournal.com/#asset-numikosov-785). The specific of this fire connected with the rapid development of its second phase. In the first phase of this fire take place heating and boiling of varnish and paint on the walls and ceiling surfaces in a remote part of the hot layer foyer, platforms before elevators and stairways. Also there was an active discharge of fuel wood gas by heating in an oxygen-free environment with wooden shingles (pyrolysis), composed of plaster ceiling. Flammable vapors from boiling of varnish, paint, charcoal, uncomplete combustion products and other gaseous substances accumulate technological beam axils of these parts of the building. The reaching of the auto-ignition temperature (300-350 gr. Celsius), or due to a sharp spark ignition, occurs the blowback, followed by involvement in the process of burning the entire surface of the walls of the stairwell to the third and later the 4th floors, also plastic and wooden doors and walls of the corridor and platforms before the elevators of the first floor. This fire led to the gathering of the Kulikovo people who were in this location during the first phase because of some reasons (ch.6,ch.8 and others) who at once and unexpectedly appeared to be in the epicenter of the fire area with a temperature of about 700 d.by.C. (http://numikosov.livejournal.com/#asset-numikosov-1121) and exposed to an open flame as a result of what they died on the spot or after a fall from a height when they tried to evacuate themselves. In this second phase of the fire the intensity of the smoke, vapor concentration of the unburned substances (http://numikosov.livejournal.com/#asset-numikosov-785) , and the temperature at the very stairwell above the third floor, had increased sharply in the corridors of the central wing of the building and adjacent areas with damaged doors(including the changes in the thermodynamic model of the fire when the air flow from the outside through the window space decreased greatly).This led to faintness and subsequent death of people who were there during the first (about 13 minutes) and the second (about 30 minutes) phases of the fire. During the combustion process the fire spread also in the stairwell above, up to the 4th floor, flaring up here with a bang, (probably, by that time people who were on the pace between the 3rd and 4th floors had already been dead) and only at that moment the fire was contained and extinguished. This phase and prolonged burning, as well as very big surfaces involved simultaneously in the combustion process, have created a high concentration of smoke, the steam of unburned substances and temperature, especially higher of these fire areas (on the 4th and 5th floors, where the biggest number of the corpses was found), for at least 40 minutes. Следствие по 2 мая: Судебно-медицинские экспертизы в законном порядке не проводились?